Shaubak Castle (Montreal) is part of the Tentative list of Jordan in order to qualify for inclusion in the World Heritage List. If you have some free time after visiting Petra, going to Shaubak castle may be a good idea. 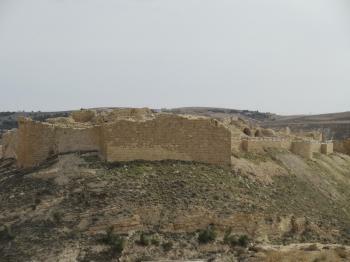 The castle is located about 30 km from Petra and is easily reachable by car in 30 minutes. Shaubak Castle is one of the best preserved crusader castle in the Middle East and, as many other crusader fortresses, has a picturesque location on top of the mountain. The external wall is well preserved and even inside there is a lot to see. The ticket is 2JD, free with Jordan Pass. Although I am not sure whether the castle has any chances to become a WHS, judging from other reviews of Israeli crusader fortresses, it is much more worth visiting. On the other hand, it is a pity that the best example of fortresses from that period – Nimrod Castle in Golan Heights, due to political situation is not even on T-list.